Johns Hopkins employees, alumni, students and friends will attend the annual Christmas Eve graveside observance honoring the founder of the university and health system, Mr. Johns Hopkins. 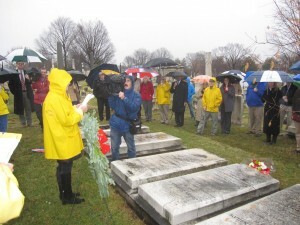 This year’s brief ceremony will take place at his grave in Green Mount Cemetery in Baltimore at 10 a.m. on Thursday, Dec. 24, the 142nd anniversary of his death. Mr. Hopkins left $7 million in his will to establish a university and hospital in Baltimore that revolutionized higher education and health care and evolved into the worldwide Johns Hopkins institutions we know today. His gift was, at the time, the largest bequest in the nation’s history. It was the foundation for all that the institutions named for him have done. The 17th consecutive Christmas Eve observance will be led by university Vice President and Secretary Emeritus Ross Jones. It will include informal remembrances of Mr. Hopkins and presentation of a memorial wreath. Jones will also briefly discuss Washington Chew Van Bibber, Hopkins’s physician. He had other prominent patients. About a decade before Hopkins’ fatal illness – and just after the Gettysburg Address – Dr. Van Bibber treated Abraham Lincoln for smallpox. Mr. Hopkins’ obituary, published in the Dec. 25, 1873, Baltimore Sun, is online. Logistics: To reach the Hopkins family gravesite, enter the cemetery’s main gate at 1501 Greenmount Ave., about five blocks south of North Avenue; drive straight up the hill, park near the crest, and look for the gathering to the right. For information, contact Dennis O’Shea.